On Monday, Mimi was suffering from the remnants from a cold and was feeling too miserable to do much of anything. Housebound, I realized it was the perfect day to deal with the mountain of chestnuts that we had and decided to spend the morning with Mimi, making marrons glacés, candied chestnuts. The morning sun filtered through the kitchen window and seemed to offer some kind of solar blessing to our project. We proceeded with great enthusiasm. At first. 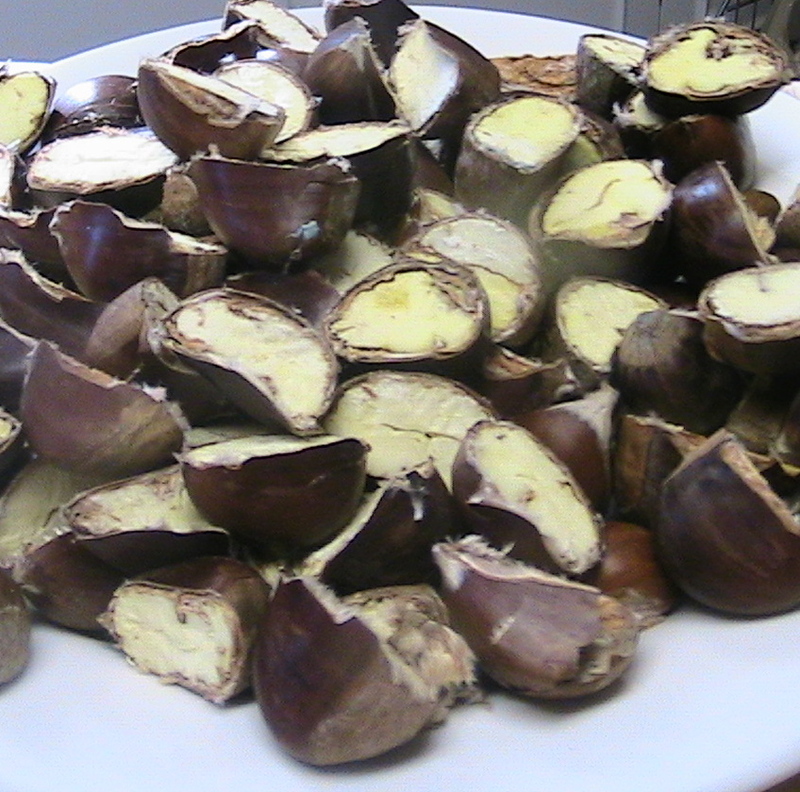 To prepare chestnuts for cooking, (1) split them into two halves and boil for 7.5 minutes. Transfer immediately to a bowl of ice water. (2) The shell will slip off easily, (3) leaving behind only the brown skins to remove. 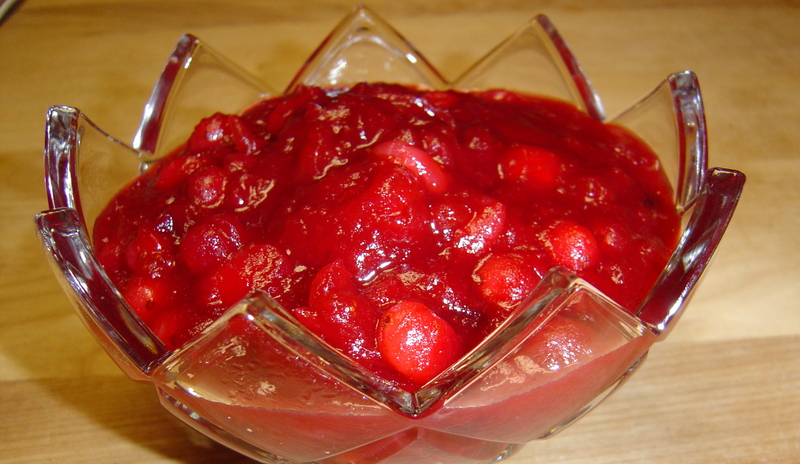 These are the instructions for blanching chestnuts that I found on-line. I’ve delineated the steps for a reason. 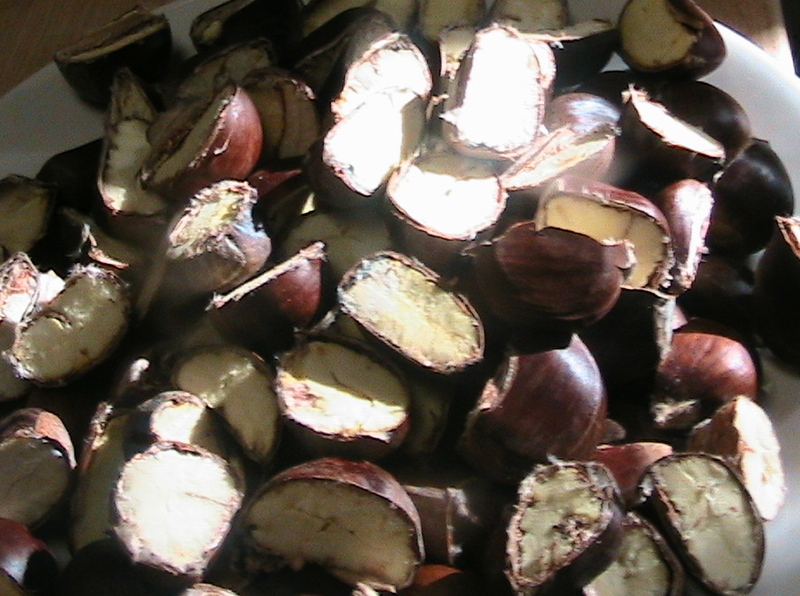 The first step, cutting the chestnuts in half, was challenging in its way, though not impossible. 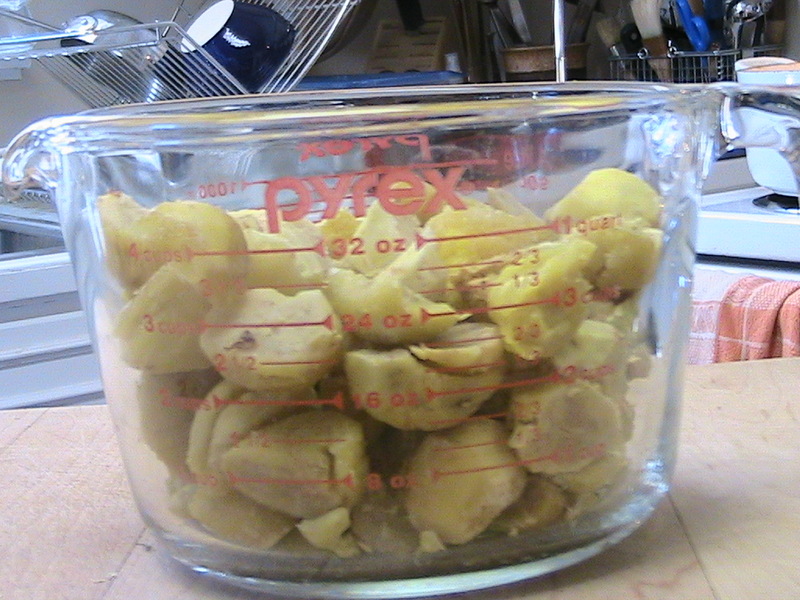 I blanched them as directed and then peeled off the outer shells, no problem. Notice, however, that these instructions do not offer a handy adjective to provide an idea about the degree of difficulty for the third step, removing those brown skins. There’s a reason for that. That brown skin was something else again. 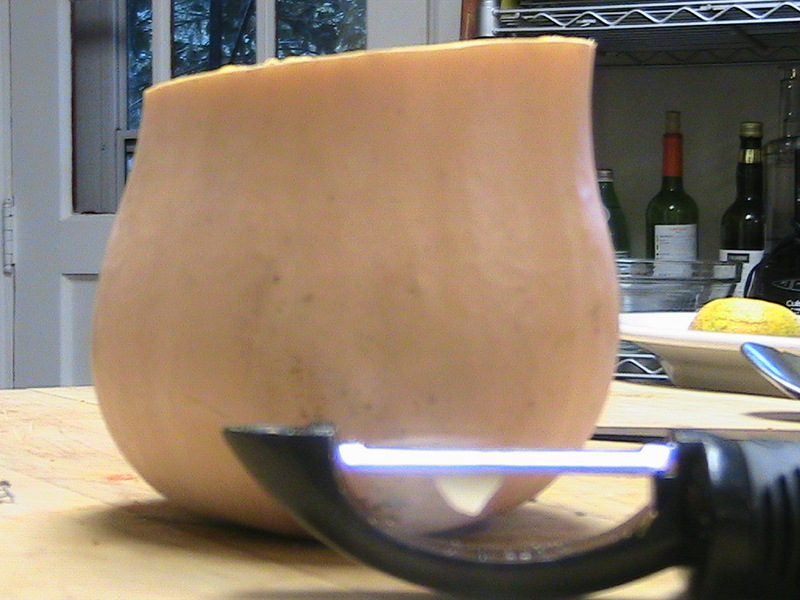 Sometimes, I could get my paring knife underneath the skin and it would slip right off. When that happened, I felt in sync with the ancient rhythms of my ancestors, who undoubtedly performed this task back in the boonies of France. Yes, that is all there is. Luckily, it was enough. To preserve chestnuts: simmer chestnuts, along with a split vanilla bean, in a small sauce pan at a low temperature until fork tender. This may take as long as two hours. 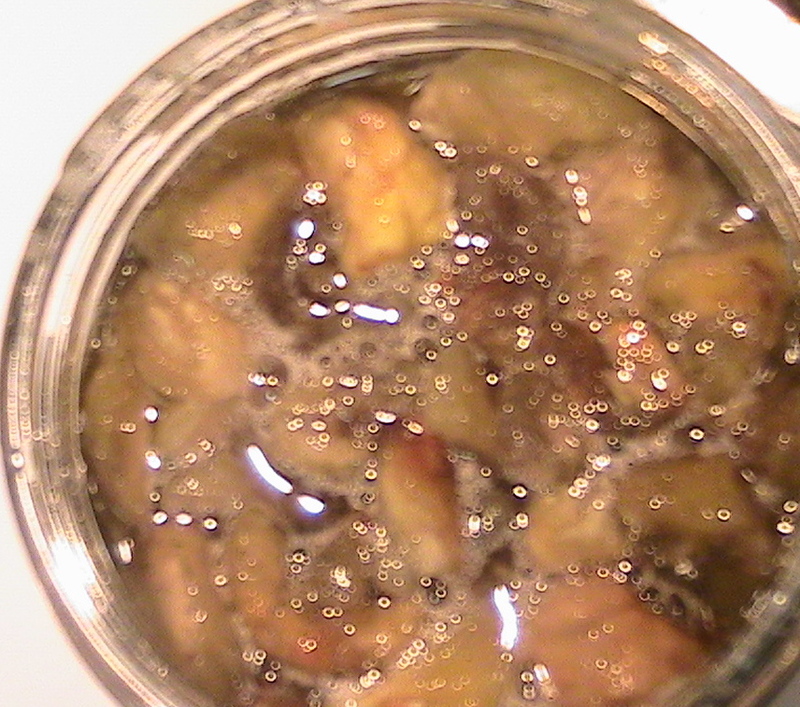 Before cooking, weigh the chestnuts and prepare a sugar and water solution of equal weight. Simmer the sugar syrup over low heat until it thickens. This may take as long as two hours. When both the chestnuts and the syrup finish, drain the chestnuts, return them to the saucepan, submerge in the sugar syrup, add a slug of vanilla, and simmer at a low temperature until the chestnuts candy. This may take as long as an hour and a half. 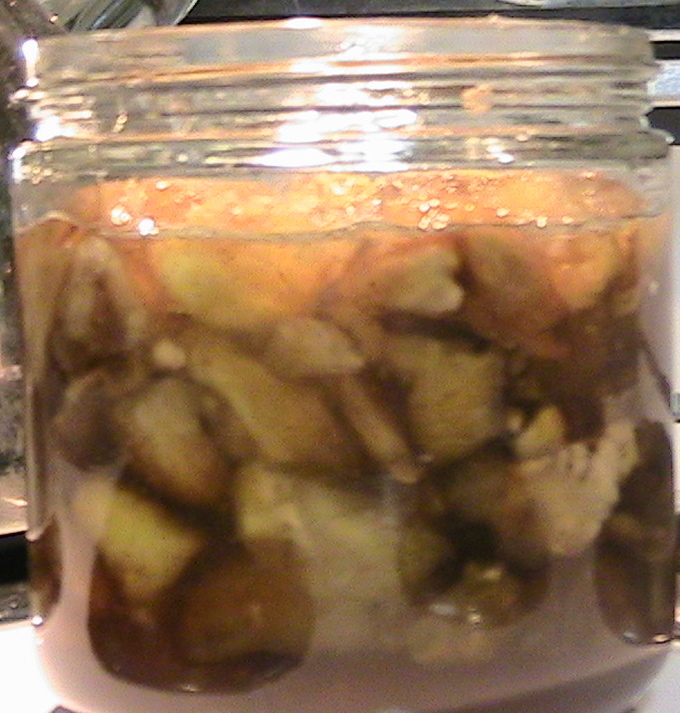 Am I happy with preserved chestnuts? Well…I’m not one to complain about the workload, but really, this was too much for me. The tips of my fingers are shredded. It’s definitely not a job to do with a small child, especially not one who is already fractious. The candied chestnuts and their syrup are, however, really fabulous over brown sugar ice cream. I’ve been thinking a lot about ancient foods lately, partly because of all the chestnuts I have piled up around here, partly because I’m teaching Michael Pollan’s The Omnivore’s Dilemma this week, and partly because of my friend Amy, who has been writing about related issues and featuring lovely photos of farro and pistachios over at The Roving Locavore. Ancient foods are those foods that humans have been eating since we slithered out of the sea and eventually became the land-dwelling creatures with complex brains that we are (errr…some of us, anyway–Sarah Palin’s book is on the bestseller list, isn’t it?). Humans and our ancestors have been eating foods like farro, chestnuts, chick peas, lentils, beans, nuts, rice, quinoa, bulgur, fish, yogurt, and greens for many millenia. These are the foods that sustained us on our evolutionary journey, the foods that gave us our large brains, the foods around which many of the world’s culinary cultures revolve (R.I.P., Claude Lévi-Strauss). But these foods don’t play major roles in the American diet in the year 2009, a fact that Michael Pollan, Eric Schlosser, Marion Nestle, and others argue contributes to the high rates of obesity and chronic illnesses experienced by a large percentage of the American population. It should not surprise me as much as it does, since I can see it for myself, but the obesity rate in my home state is 34%, according to the most recent CDC figures. Of course, the sedentary lifestyles of my fellow citizens undoubtedly contribute to that figure, but popular local foods like chicken fingers, hot wings, and fried macaroni and cheese (I kid you not) are also likely culprits. And while Alabama is one of the fattest states in the nation, it is by no means the exception. So many people have written about the poor American diet and the repercussions of our terrible eating habits that it seems unnecessary to do that now. Instead, my purpose here is to celebrate one these ancient wonders in the best way that I can think of: by cooking and eating it. 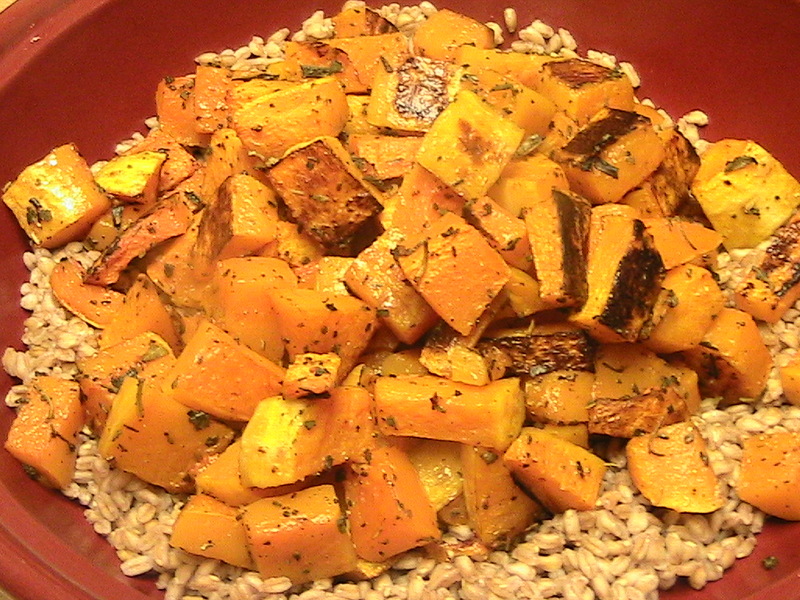 And, of course, by sharing the recipe for farro with roasted butternut squash. 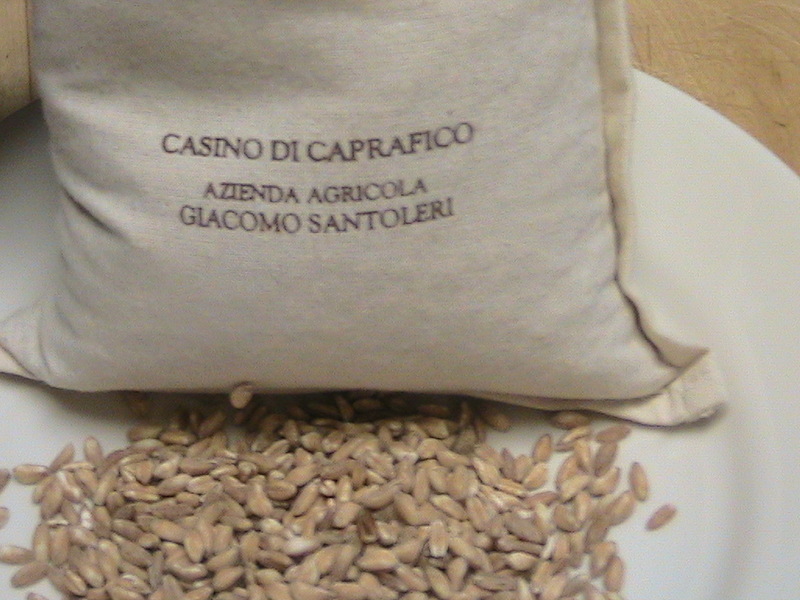 Farro may be one of the oldest foods that humans eat as well as one of the healthiest. It’s very easy to cook (just boil it until it softens, but still retains a nice, chewy texture) and also happens to taste quite good. Really very good, in fact. Although a bit expensive and difficult to find in these parts, it can be purchased on-line from Earthy Delights. Preheat over to 425 degrees. In a large sauce pan, completely cover the farro with water; bring to a boil over high heat, reduce heat the low and simmer farro for 30 minutes or until slightly chewy, but cooked through. Meanwhile, toss the squash with olive oil, sage, salt and pepper. Spread out squash in one layer on a large, rimmed cookie sheet. Roast for 35-45 minutes, until the squash cooks through and caramelized. Drain the farro and place on a large serving platter. Add salt and pepper to taste. 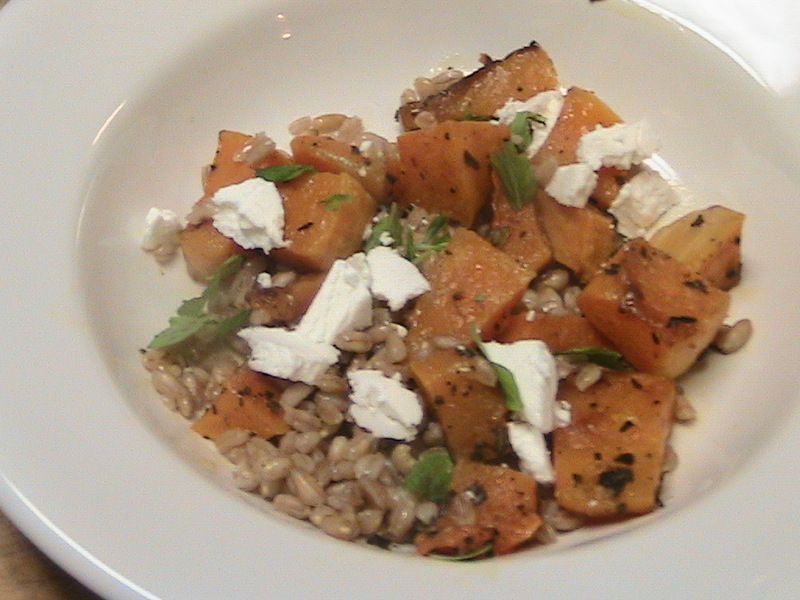 Cover with the farro with the roasted squash, dot the squash with pieces of goat cheese, sprinkle with parsley and basil. Drizzle with a teaspoonful or so of good quality balsamic vinegar, if you’d like. Serve immediately. Yields 3-4 servings.